Flagship conrad-johnson ARTsa power amp arrives in the UK | What Hi-Fi? 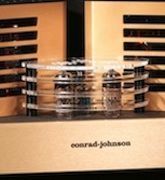 Now available in the UK is the flagship stereo amplifier from US manufacturer conrad-johnson, the ARTsa. An all-valve design, delivering 140W per channel, it sells for £18,500. The ARTsa is based on the Fairfax, Virginia company's ART monobloc amplifier, which is a 275W design, and is essentially an ART split in two, using two pairs of KT120 output tubes for each channel rather than the eight used in the single-channel amp. And the amplifier has been designed with as simple a circuit layout as possible, using a single triode as a voltage gain amplifier, direct-coupled to a cathode-coupled phase inverter which drives the output stage. In the ARTsa, a single 6189 tube and a pair of 6N30Ps are used upstream of the eight KT120s. The amp also uses precision laser-rimmed metal foiled resistors, Teflon CJD and large-value polypropylene capacitors (although there are no capacitors in the audio circuits or their associated power supplies) and proprietary wide-bandwidth transformers. The ARTsa may have been designed as a more compact and affordable alternative to a pair of ART monoblocs, but it still measures 48.25cm wide, 47.6cm deep and 18cm tall, and weighs just over 37kg. conrad-johnson is distributed in the UK by Audiofreaks.